GIVE • LOVE • LEARN is our school motto. GIVE because St Lawrence looked after the poor and therefore it is our mission to give of ourselves in the spirit of our patron. LOVE because the motto of our sister school, St Peter Chanel Primary School, is “Love One Another” and therefore we want to honour this connection to our host school. LEARN because this is our core business as a school. 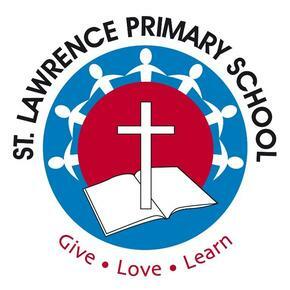 The symbols in our logo are therefore connected to these essential elements of our identity – the people reaching out to each other in a spirit of giving; the cross of Jesus Christ signifying His love for us; and the book representing our learning.